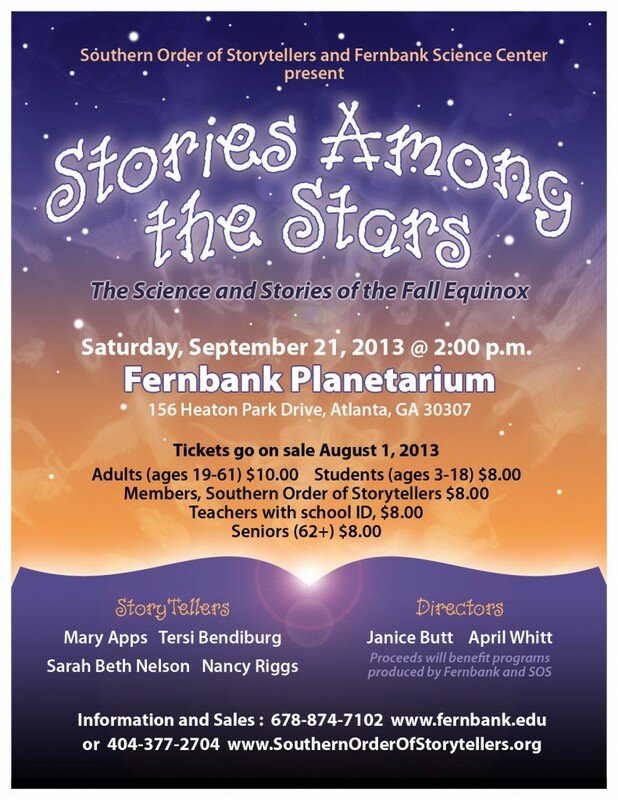 On Saturday, September 21 at 2 p.m., Fernbank Science Center and the Southern Order of Storytellers collaborate on Stories Among the Stars, a fund-raising event marking the autumnal equinox. As the star projector depicts the night sky on the planetarium dome, storytellers Mary Apps, Tersi Bendiburg, Sarah Beth Nelson and Nancy Riggs will share tales of the autumn constellations, including the stories of Demeter and Persephone, Andromeda, the Milky Way, and Mars. Bridging the gap between folklore and science, Fernbank Science Center astronomer April Whitt will lead a tour of the season's brightest stars, and answer questions about the reason for the seasons. DeKalb County School's Fernbank Science Center is located at 156 Heaton Park Drive NE, Atlanta, GA, 30307. The program begins at 2 p.m. on Saturday, September 21. Parking is limited. Tickets are available at the Fernbank web site. Cost is $10.00 per person. Don't miss this opportunity to enjoy the science and stories of the night sky.